Dietrich Bonhoeffer was a German pastor and theologian who was executed in 1945 by the Nazis for his involvement in a plot to assassinate Hitler. In 1937, the same year that the Nazis closed Bonhoeffer’s Finkenwalde seminary, Bonhoeffer published The Cost of Discipleship, a book of meditations on the Sermon on the Mount, the nature of grace, and Paul’s teachings on justification and sanctification. By looking at the Sermon on the Mount, Bonhoeffer describes just what that burden might look like for the Christian and what kind of life Jesus calls his followers to live. The key is to focus entirely on Jesus, with a single-minded devotion that puts obedience to Christ over and above our loyalties to family, friends, nation, possessions, even our own selves. The teachings are difficult, not so much because they’re difficult to understand (although Bonhoeffer’s prose can be circular and repetitive), but because these ideas are difficult to accept. 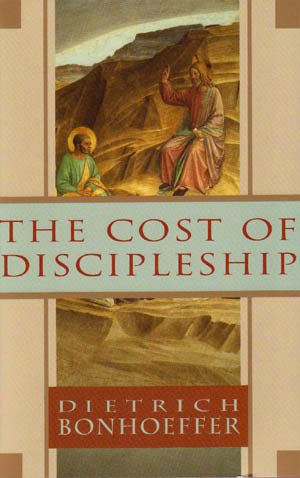 The Cost of Discipleship is one of the classics of 20th-century Christian thought, but I find myself torn about a lot of it, partly because I can see how Bonhoeffer’s concept of cheap grace and single-minded devotion can be turned into a hammer with which to beat down other Christians who aren’t living up to our particular standard of obedience. (Indeed, I’ve seen that done over such disputable matters as how long one needs to spend in prayer daily or how “holy” one’s choice of entertainment must be.) Yet Bonhoeffer himself says that Christ is the only one who calls and that each person’s call to obedience might look different. So those who measure others by their own calling are getting Bonhoeffer wrong. Still, even keeping that in mind, I found it difficult at times to see just how salvation by grace fits into Bonhoeffer’s thought here. The idea is not absent, however. Bonhoeffer talks about Luther’s idea of sinning boldly and makes the excellent point that this idea should not be taken as license to do whatever we please but as reassurance that God still loves us when we do sin, that we don’t have to hide from God but can come boldly to him, confess, and receive forgiveness. The problem is that this idea gets lost amid all the talk about obedience, so it’s easy to miss it. I also think that Bonhoeffer frequently underestimates how difficult it is to discern just what God is calling us to do. He treats such questioning as little more than an excuse or a sign of hidden sin, but I think that it can be genuinely difficult at times, and his attitude would be supremely unhelpful to someone struggling with genuine questions about how to live the Christian life. However, when I remember that Bonhoeffer was writing at a time and place when many in the church had chosen to align themselves with the Nazis, then it becomes easier to see that the choices are sometimes very clear and we refuse to see them. In that respect, this book is an important wake-up call to the church and to Christians who choose to collude with evil, and that’s a problem that isn’t confined to Bonhoeffer’s time. There was a lot in this book that I found convicting and inspiring. It was an ideal pre-Lenten read and would perhaps have been an even better Lenten one. It would certainly put just about anyone who reads it in a mood of self-examination. Bonhoeffer’s teachings about holding possessions loosely, loving both our neighbors and our enemies, and not judging others are profound and important. His teachings about the church emphasize the importance of the Incarnation, and I was moved by the thought of the church itself as a person, as the very Body of Christ. I think it’s also important to remember that Bonhoeffer wrote this book early in his life. He was only 31 years old when it was published, and he’d been working on it for several years. The chapter on Bonhoeffer in James C. Livingston and Francis Schüssler Fiorenza’s Modern Christian Thought states that Bonhoeffer later expressed doubts about some of what he had written. From what I remember of his Letters and Papers from Prison, which I read years ago, he doesn’t come across as quite the absolutist there as he does here, so his thinking probably did evolve over time. In this 1941 letter to Eberhard Bethge, Bonhoeffer remarked that he had come to see that The Cost of Discipleship was a dangerous book, although he stood by what he had written. And despite some of my qualms, I do think the crux of his argument, that obedience to Christ takes precedence over all other loyalties for the Christian, is important. It’s just that it can be difficult to know just what such obedience looks like. This entry was posted in Classics, Nonfiction, Religion. Bookmark the permalink. I have that new biography about him and I’m eager to begin reading it. Lent would be a perfect time to begin. Thanks for the review of The Cost of Discipleship and also your thoughts, which clarified the distinctions between cheap grace and costly grace. There seems to be so much of the former these days since churches are also businesses. Is that the Metaxes biography? One of the people who came to our book group had just read it and liked it a lot, although I see from Lisa’s comment that there’s been more than one recently. I’d like to read a good bio of Bonhoeffer sometime. I remember reading a review (last year maybe) about two bioographies that had come out around the same time, and the review made me want to read more about him (though not necessarily either of those biographies). It sounds like this book might not be the best place to start either, though the distinction between cheap and costly grace is very thought-provoking (especially coming up to Lent). what would you recommend as an introduction? That’s a hard question. I actually think his life is as interesting and inspiring as his writing and am tempted to suggest starting with a biography, but I haven’t read any of them, so I can’t say whether they’re good. I do recommend the documentary that come out a couple of years ago: Netflix has it available for instant viewing. As for his work, I started with his Letters and Papers from prison, and I know a few other people who started there, but I found it tough going. It was a long time ago, and I doubt I’d find it so hard now. Life Together is nice and short, and I liked it, so that might be a good choice. I have admired people who stand for what they believe in regardless of what they face or what the threat is. Most of us succumb to the slightest threat to our finances etc. It is admirable. I think one reason people still read Bonhoeffer today is because he did stand up for what he believed. I can think of so many examples that seem like cheap grace, although who knows what’s going on in people’s hearts. For me, it comes down to whether I know something I’m doing is wrong and just do it anyway, knowing God will forgive me. That seems far more serious than an honest mistake or a momentary loss of self-control. I can remember reading this and feeling very convicted when I was younger, but I wasn’t asking some of the questions you are asking here. These days, my go-to book is Brother Lawrence’s Practice of the Presence of God. It’s been years since I read this one, but I recently read a new biography on Bonhoeffer and it was fascinating. It’s so sad that he was killed during WWII for standing up to the Nazi party. So many great minds lost. His life was fascinating, and a tragic loss. Which biography did you read? This sounds like a contemplative read to add to my future list. I’m focused on reading the Bible in chronological order this year and am already behind on that.